Machinery Sales | MAST TECHNOLOGY INC.
MAST has many years of experience in providing high quality, new and used ammunition machinery. Our customers include all major U.S.A. producers, as well as other manufacturers in Mexico, Central and South America, Europe, Africa, Australia and Asia. We carry a large inventory of machinery for ammunition production from .22 caliber to 20mm. MAST provides machinery “as is” or fully reconditioned and tooled, from individual pieces of machinery to complete production lines. MAST has over three hundred ammunition specific machines in our inventory. We have options and availability of at least that much around the world. Let us know your requirements and we will find the right machine for your application. If a machine is not available to do your job, we can modify or build from scratch the machine you require. MAST also sells parts and components of machines. These include but are not limited to hoppers/collators, guards, die blocks, and attachments. We have many machines that are available for spare parts. Before you make it, see if we have it. We have a variety of machines for sale at all times. Condition of machines will vary from newly rebuilt to used and stored outside. Typical machines are Waterbury Farrel Strait Line loaders. These machines have been stored inside since they were taken out of production a few years ago. These machines can run at 60-66 parts per minute. These types of machines are a standard in the industry. They are the design backbone of modern ‘table top’ loading machines. 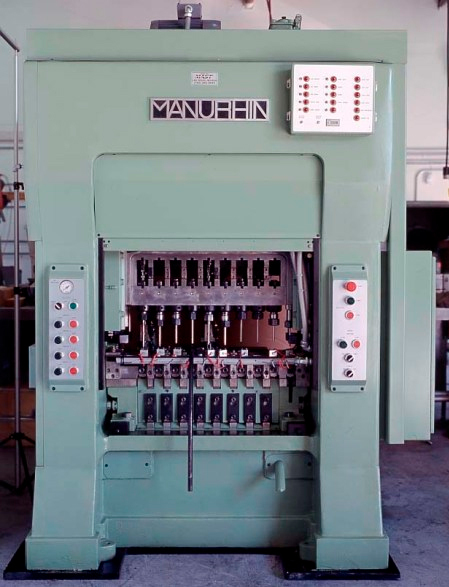 These machines are still used today worldwide for ammunition manufacture. These machines were originally designed for .30 caliber; however, they work well in a variety of pistol and rifle cases.